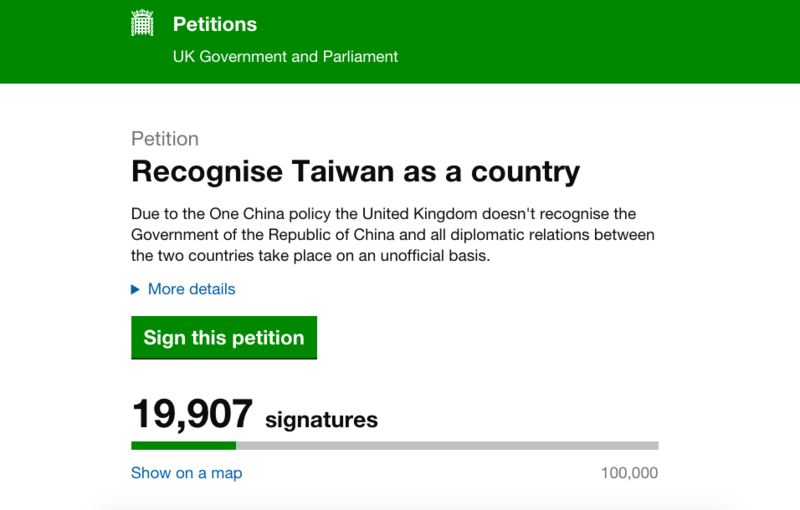 The United Kingdom government is expected to issue a response to a widely-circulated petition posted on the UK Government and Parliament website calling for it to recognize Taiwan as a country. This comes after the petition, started by British citizen Lee Chapman on Jan. 18, garnered more than 10,000 signatures in less than a week. The British government responds to all petitions that get more than 10,000 signatures. The petition urges the UK government to recognize the Republic of China and allow official diplomatic relations to take place, both of which it says do not happen currently due to the One China policy. Chapman’s petition was shared widely on social media networks, including in a more than 20,000 member Facebook group for Taiwan youths taking part in the working holiday scheme in the UK. The petition has reached 19,907 signatures at the time of this article’s publication. The UK government will consider a petition for debate in Parliament once it reaches 100,000 signatures. Only British citizens and UK residents can sign the petition, which expires Jul. 18. 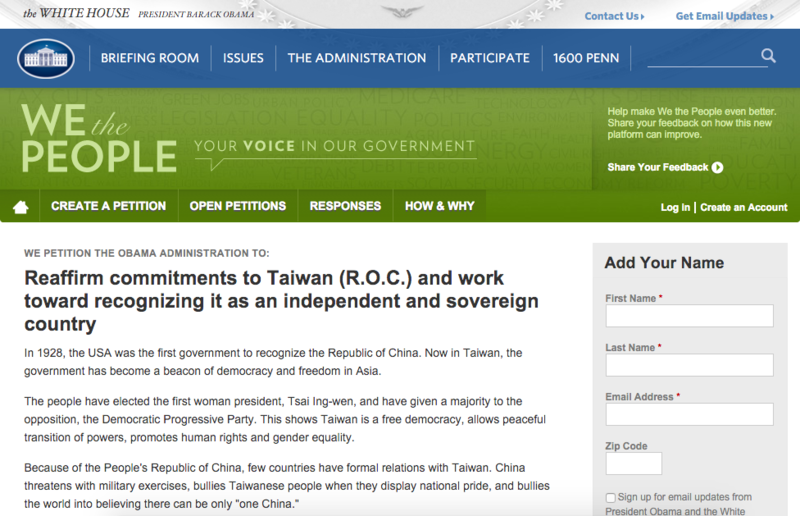 Another similar petition has since been started on the White House website, asking the United States government to “reaffirm commitments to Taiwan (R.O.C.) and work toward recognizing it as an independent and sovereign country”. That petition, which currently has 8,202 signatures, calls Taiwan “a beacon of democracy and freedom in Asia” following the island’s recent election of Tsai Ing-wen as its first woman president. In it, the creator, known only by the initials C. S. from Titusville, Florida, calls on the US government to stand on the side of democracy and not coercion by the People’s Republic of China. According to US laws, US President Barack Obama’s Administration will review and issue a response to all petitions that cross the 100,000 signature threshold in one month. The US petition will expire on Feb. 18.